What do you do when you've got a bushel of corn from the farmer's market and aren't feeling steamed corn on the cob yet again? If you have a few chilies and a sharp knife you can make a quick sauté that packs a shocking amount of flavor. Using brown butter adds depth, and finishing the dish with the scraped, starchy pulp from the cobs and a splash of olive oil creates a creamy mouthfeel, just in case you were craving creamed corn but didn't want all the calories. 1. Cut kernels from corn with a sharp knife, working over a large bowl to avoid making a mess. Using the back of your knife, scrape the remaining flesh and pulp off the cobs into a separate bowl. Discard stripped cobs. 2. Heat butter in skillet over medium heat until very fragrant and starting to brown. Add corn kernels, season lightly with salt, and sauté, stirring occasionally, until deep golden in color, about 7 minutes. 3. 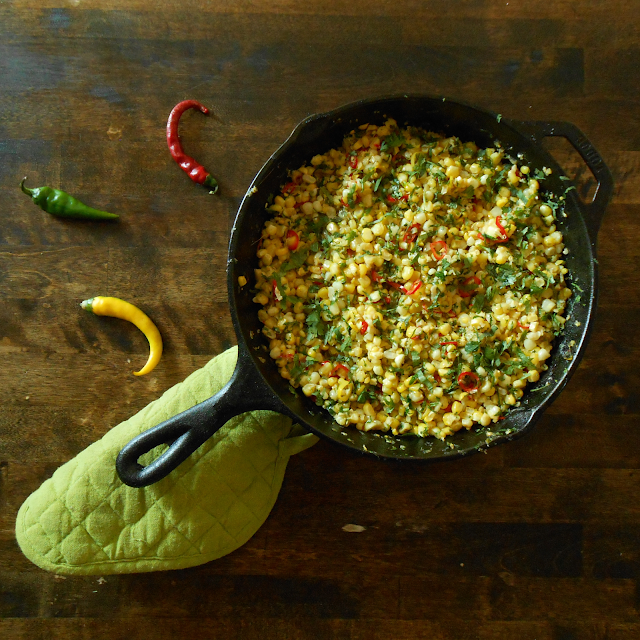 Add scraped corn, chilies, and 1/4 cup water to skillet. Bring to a boil and stir, scraping the bottom of the pan to deglaze. Simmer until liquid has thickened, about 2 minutes. Remove from heat. Stir in cilantro, lime juice, and olive oil. Taste and adjust seasoning with salt.